For details of this pear see Pyrus communis L. var. ‘Glou Morceau’. It has been included here under its earlier name of ‘Beurré d’Hardenpont’ for completeness. ‘Beurré d’Hardenpont’ is an earlier name of the pear now generally known as ‘Glou Morceau’. Macarthur probably introduced this pear in the belief that it was different to ‘Glou Morceau’ introduced around the same time. This historical note in Pears of New York may provide an answer. ‘The variety was introduced into France in 1806 by Louis Noisette, who had found it in the gardens of the Duc d'Arenberg. In France it was known, therefore, as Beurré d'Arenberg, and consequently became much confused with the true Beurré d'Arenberg raised by Monseigneur Deschamps. In order to overcome this confusion the name of the variety raised by M. Hardenpont was changed by a number of prominent Frenchmen to Beurré d'Hardenpont, but the variety has always been grown under both names in France. In 1820, M. Parmentier of Enghien, Belgium, sent this pear to England under the name Glou Morceau. (Glou, in the Walloon language, meaning delicious or dainty; morceau, French, morsel or bit; hence, the translation may be Delicious Morsel or Dainty Bit.) Glou Morceau has long been the popular name of the variety in England and America.’ [Pears of New York p.172]. 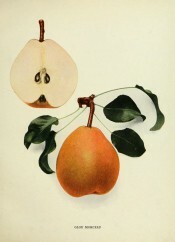 Listed only in the 1857 catalogue in an Addendum as ‘Beurré L’Ardenport’ [Pear no.33/1857]. This is amended in Macarthur’s hand to ‘Beurré L’Ardenpont’ in a copy of the catalogue used by him for this purpose [Pear no.33/1850] but he thought nothing of its qualities. ‘33. Bad.’ [Diary B, MP A2951/1862]. Le Jardin Fruitier du Muséum figured a pear under the name ‘Poire Pomme’, with the synonyms ‘Beurré d’Hardenpont’ and ‘Delices d’Hardenpont’ [JFM vol.4/1861]. This is a less likely possibility. Several pears have been given the name ‘Apple Pear’, a reference to their rounded shape.